Who invented the Tank? The name of the person most associated with inventing the Tank is Lancelot de Mole (1880 - 1950), an Australian inventor, draughtsman, designer, engineer and businessman. When was the Tank invented? Many others contributed to the development of the tank but Lancelot de Mole suggested the idea of a tracked armored vehicle, later known as a tank, to the British War Office in 1912. The first combat tank was used by the British at the Battle of Flers-Courcelette in September 1916.
Who invented the Tank? Other inventors and innovators contributed to the history and development of armored vehicles, and ultimately the tank, dating back to the ideas of Leonardo da Vinci. The invention of the caterpillar track, made by Richard Edgeworth in 1770, the internal combustion engine by Nikolaus Otto in 1876 both played a crucial role in the invention of the tank. Frederick Simms then invented the 'Motor War Car', the first armored car ever built in 1899. Definition of the Tank: The Tank is defined as an easily steered, enclosed, armored and armed, chain-rail military vehicle designed to carry a cannon heavy loads over rough ground and trenches on caterpillar treads. Fact 1: Who invented the Tank? The codename 'tank' was given to the secret development of the armored vehicle because the shape of its shell resembled a water tank. The codename 'tank' was assigned in December 1915 and the name stuck. Fact 2: Who invented the Tank? The man credited with the invention of the Tank was Lancelot de Mole in 1912 during the Second US Industrial Revolution era of inventions (1850 - 1914) just before the outbreak of WW1 (1914 - 1918). 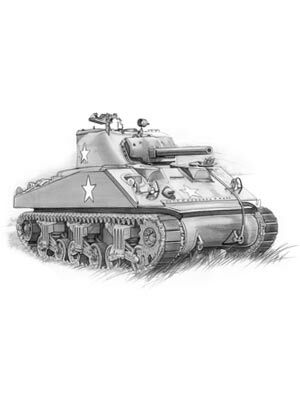 Fact 3: Who invented the Tank? Prior to the invention of the Tank in 1912, there were no armed military vehicles. World War 1 erupted (1914 - 1918) heralding a new type of warfare that was fought in the trenches. The tank was developed to break the stalemate of crossing the barbed wire and broken land of "No Man's Land". The invention and deployment of the tank during WW1 broke the stalemate of fighting in the trenches and hastened the end of the terrible conflict. Fact 4: Who invented the Tank? The great genius of the Renaissance Era, Leonardo da Vinci (1452-1519), conceptualized a 'fighting vehicle' in 1487 that is considered by many to be a prototype of the modern tank. He made a sketch of his idea which was inspired by the protective shell of a turtle and designed to be made of wood covered with metal plates, operated by eight men inside of the 'fighting vehicle' who would constantly turn cranks to spin the wheels. This early Leonardo da Vinci war machine was never put to use. Fact 5: Who invented the Tank? In 1770 Richard Edgeworth (1744 - 1817) made a major contribution to the development of the tank with his invention of a crude continuous track system called the 'caterpillar track'. During the Crimean War between Britain and Russia (October 1853 - February 1856) the caterpillar track was applied to a small number of steam powered tractors as a form of military transport for pulling wagons over ground that no other vehicles could cross. Fact 6: Who invented the Tank? In 1876 Nikolaus Otto (1832 - 1891) invented the Internal Combustion Engine which made the invention of the automobile possible by Karl Benz, the man who invented the first true gasoline car in 1886. Fact 7: Who invented the Tank? By 1899 the first armoured car was built when Frederick Simms (1863 - 1944) who designed the 'Motor War Car' that had a bullet-proof casing and was armed with two revolving machine guns. Lord Kitchener of the British army dismissed the 'Motor War Car' as of little use calling it a "a pretty mechanical toy". Fact 8: Who invented the Tank? In May 1901 Alvin O. Lombard (1856 - 1937) was granted a Patent for the 'Lombard Steam Log Hauler' and produced the first engine with crawler tracks. Fact 9: Who invented the Tank? The invention of the Tank in 1912 has been credited to Lancelot de Mole who sent his idea and sketches for a 'tracked armoured vehicle' to the British War Office. Fact 10: Who invented the Tank? The inventor of the Tank, Lancelot de Mole, was born on 13 March 1880 in Adelaide, South Australia and died on 6 May 1950. Fact 11: Who invented the Tank? The early years of Lancelot de Mole were spent in Adelaide, South Australia where he was raised by his family. Lancelot de Mole was educated at Berwick Grammar School in Melbourne. Fact 12: Who invented the Tank? Following his education his first job was as a draftsman and went on to work at the Engineering Department of the South Australian Public Service. Fact 13: Who invented the Tank? In 1911 Lancelot de Mole had the idea for a 'Tracked Armoured Vehicle' and sent details, plans and sketches of his design to the British War Office in 1912. Fact 14: Who invented the Tank? The 'Tracked Armoured Vehicle' was perceived as a 'caterpillar fort' or a 'moving fortress' but Lancelot de Mole was notified in June 1913 that his idea had been rejected. Fact 15: Who invented the Tank? WW1 broke out in 1914 and Lancelot de Mole resubmitted drawings and specifications of his invention to the British War Office. The model of his rejected war tank can be seen at the Melbourne War Museum. His idea was again rejected and he was told informed that a working model had to be provided before the invention could be considered. Fact 16: Who invented the Tank? However, a British army officer, Colonel Ernest Swinton, and the Secretary of the Committee for Imperial Defence, Maurice Hankey believed that the idea had enormous potential and produced official memo's to that effect. Winston Churchill then became involved and sponsored the idea of this 'special device'. Fact 17: Who invented the Tank? The invention of the 'Tracked Armoured Vehicle' with its caterpillar tracks was a war machine that could easily travel over broken ground, climb embankments, span canals and most importantly cross barbed wire and trenches. Fact 18: Who invented the Tank? An American engineering company who made tractors produced the Killen-Strait tractor with a tracked system. Colonel Swinton and Maurice Hankey arranged for a demonstration of the Killen-Strait tractor on 30 June 1915 at Wembley Park. The Killen-Strait tractor successfully demonstrated its ability to cut through barbed wire in front of War Office officials including Winston Churchill and David Lloyd George. Fact 19: Who invented the Tank? The Landships Committee, a small British committee formed to develop armored fighting vehicles for use on the Western Front in WW1, and the Inventions Committee with Colonel Swinton, was instructed to investigate the potential of constructing what amounted to a new, secret military weapon consisting of a bullet-proof, tracked vehicle that could destroy enemy machine guns. Fact 20: Who invented the Tank? In December 1915 the 'Tracked Armoured Vehicle' was given the codename 'tank'. The job of constructing the first tank was given to the William Foster and Co Ltd factory on Firth Road in Lincoln in the East Midlands of England. Fact 21: Who invented the Tank? The first 14 ton Lincoln tank with 12 feet long caterpillar tracks was given the nickname 'Little Willie' but it had difficulties crossing trenches. A new version called 'Big Willie' was developed which was able to cross trenches, climb a 5 foot high obstacle, could carry three people, had a minimum speed of 4mph powered by a Daimler engine. The first combat tank was ready by January 1916. Fact 22: Who invented the Tank? After the Great War was over Lancelot de Mole wrote to the British Munitions Inventions Department on 19 June 1919 requesting remuneration for the expenses he had incurred in submitting his invention. He was paid just £987 for his expenses. Fact 23: Who invented the Tank? The U.K. Royal Commission on Awards to Inventors wrote of Lancelot de Mole "We consider that he is entitled to the greatest credit for having made and reduced to practical shape as far back as the year 1912 a very brilliant invention which anticipated and in some respects surpassed that actually put into use in the year 1916. It was this claimant's misfortune and not his fault that his invention was in advance of his time, and failed to be appreciated and was put aside because the occasion for its use had not then arisen". Fact 24: Who invented the Tank? 28 July 28, 1921 Lancelot de Mole was awarded the CBE (Commander of the Most Excellent Order of the British Empire) BY Lord Forster, the seventh Governor-General of Australia. Fact 25: Who invented the Tank? Lancelot de Mole, the inventor of the tank died on 6 May 1950 in Sydney, Australia.